THE GOVERNMENT HAS announced a cut to public sector pensions of €100,000 and over this evening. In a statement to the Dáil, the Minister for Public Expenditure and Reform said that a 20 per cent reduction would be imposed on the portion of any pension of €100,000 and above. Currently a higher reduction rate of 12 per cent is imposed on any public sector pension above €60,000 as part of measures introduced earlier this year. The new measures mean that anyone on a public sector pension of €125,000 will see their pension reduced by €13,760 or around 11 per cent while someone on a pension of €150,000 will see their remuneration fall by €18,760 or around 12.5 per cent. Howlin estimated that this would save the State around €400,000 annually. The measure is an amendment to public expenditure legislation introduced next year that will go to the Seanad before being brought back for debate in the Dáil. “I consider this progressive amendment is also in the broad public interest and is just and equitable in all the circumstances,” he said. The cut means that around 250 so-called ‘super-pension’ holders including former presidents, taoisigh, members of judiciary and civil service secretaries general as well as former senior figures in the security forces will see their annual pension income reduced. 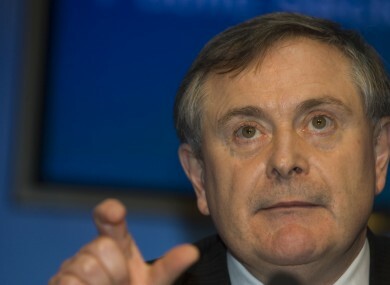 Howlin’s announcement came as part of a debate on the reduction in judges’ pay bill, legislation introduced as a result of the recent constitutional referendum which was passed by the electorate. Fianna Fáil has called on the government to go further and cut current salaries paid in the civil and public service. In a statement Sinn Féin public expenditure and reform spokesperson Mary Lou McDonald said that the reduction “failed to tackle the thorny issue of bumper annual pensions paid out to former taoisigh”. Email “Government announces cut to public sector pensions over €100k”. Feedback on “Government announces cut to public sector pensions over €100k”.